Charlton have denied reports that ex-Bristol City manager Brian Tinnion has been appointed as head of their youth development scheme in Spain. Tinnion was recently quoted as saying that he had been approached for the role, and would be recruiting coaches to assist him. But the Addicks have insisted that the reports are "wide of the mark". 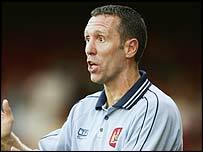 Tinnion stepped down as City boss in September 2005, and then played for Aldershot before leaving in January.